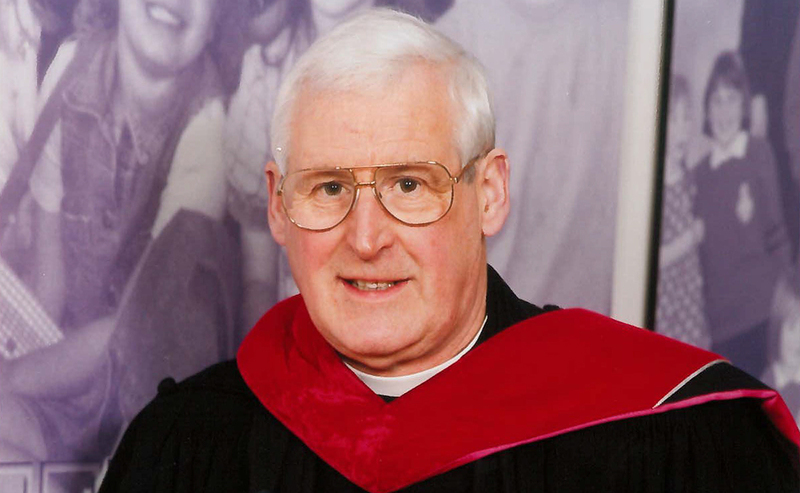 Rev Angus R. Mathieson, Secretary of the Mission and Discipleship Council, has written this moving obituary for Rev Eric Douglas Aitken. Eric Douglas Aitken, known as Douglas, will be remembered by many people, from many different parts of the community, as a parish minister, local councillor, religious broadcasting producer, Rotarian, scouting chaplain, husband, father and friend. He died peacefully at Queen Margaret Hospice in Dunfermline on Tuesday 20th March 2018. He, from his own admission, had an unexpected, but also very full career that started with ambitions to be a marine engineer and a life on the sea but moved into the ministry in Africa, in broadcasting, in the parish and in a number of locum roles well into his retirement. Douglas was licensed by the Presbytery of Glasgow on 14th April 1961, and then ordained by that Presbytery on 26th October 1961, before taking up his second charge of St Andrew’s Nairobi in Kenya. He became the senior minister there in May 1966 where, his own notes indicate, that he also had responsibility for and conducted worship in 7 different regions in the Parish of Uganda and Tanzania! With the unusual surroundings, and with many senior diplomats, business people and families from around the world as part of his congregation and session, these years in East Africa proved to be a pivotal period in moulding his approach to his ministry by challenging him to communicate to such a diverse community of people. It was the custom then for the Overseas Council of the Church of Scotland to recognise service given by mission partners in what is known as a resignation minute, and for Douglas, this minute records that this was a time, “in which pastoral care and leadership were vital, and in which Mr Aitken had played a notable part.” He served as Clerk to the Presbtyery of Nairobi, and also as Depute Clerk to the General Assembly of the Presbyterian Church of East Africa. That same minute of 1969 talks of regular radio and television broadcasts in Kenya, as a source of comfort and challenge and this love of broadcasting, especially on the radio, never left him and he continued to work in this area long into his “retirement” from full-time parish ministry. Douglas would spend eighteen years as a senior producer of religious broadcasting with BBC Scotland, eventually leading a team of nine. Always keen to widen the appeal of this medium, his work took him to parishes the length and breadth of Scotland encouraging ministries in the use of broadcasting in communicating the gospel to the widest number of people possible. His fascination with the power of broadcast media was laid when students from Trinity College were marched to the studios of BBC Scotland in the West end of Glasgow, and forced to perform in a studio, which was the former clubhouse of Hillhead Bowling Club. He acquitted himself well and always looked to see how he could mix his calling with the medium, and in later life, he was a valued volunteer of the broadcasting team at Central FM. 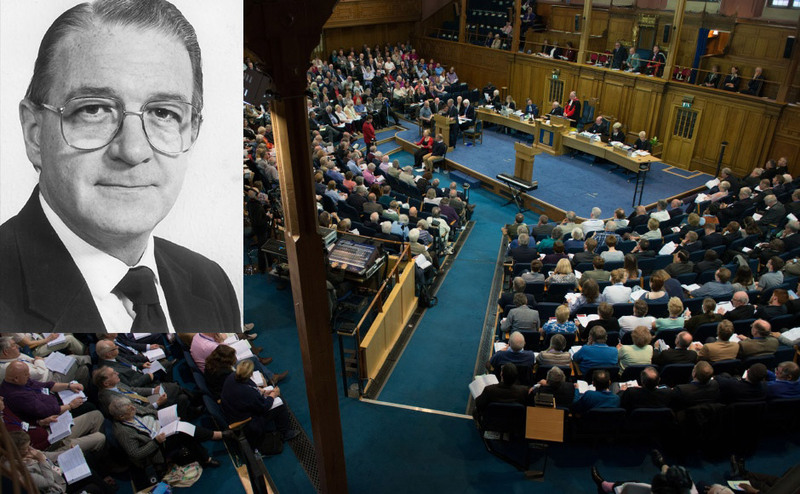 For 19 years, he also produced what we would now call podcasts, reflecting on the day’s proceedings at the General Assembly of The Church of Scotland. Douglas resigned from the BBC in 1987, citing personal reasons, and his next steps in ministry were equally surprising, innovative and challenging. He became part of the Ministry team at Mayfield Church in Edinburgh, and also took on the part time role of Director of the Church Garden Project at the 1988 Glasgow Garden Festival, with its glass church and theme of living waters. He joked that it did became a bit repetitive and slightly unimaginative the number of ministers leading worship who chose Psalm 47 over the weeks of the Garden Festival… He then became director of media and training at the ground-breaking Buckhaven Parish Church Community Project for eighteen months before taking up his first Scottish charge in 1991 in Clackmannan Parish Church where he finished his full-time career in 1998. In all his working life, Douglas was involved in ecumenical activity, in the Scottish Christian Youth Assembly, as well as in the World Council of Churches (WCC). He was a youth delegate at the 3rd Assembly of the WCC in Delhi, India, in 1961, and then covered the 6th Assembly in Vancouver for the BBC. He was heavily involved in the work of the General Assembly of The Church of Scotland too, serving terms on the Assembly Arrangements Committee; the Central Committee of the then Women’s Guild; as well as the Board of Communications. He was Moderator of Dunfermline Presbytery from 1977 to 1978 while at the BBC, and up until poor health curtailed his activity, was locum minister and interim moderator in successive appointments in both Stirling and Dunfermline Presbyteries. These final appointments, and his time as a member of the Saline Church community proved to be as exciting, inspiring and fulfilling as his more high profile roles in his career, as he was able to really enjoy the preaching and pastoral elements of ministry and help communities find healing and new starts. Douglas was born and educated in Wimbledon, London. His parents, John and Marion (May) Aitken hailed from Arbroath, and it was John’s work as a sales representative for the jute engineering company of Fraser’s of Arbroath which had taken him and his wife south. The family returned to Glasgow in 1945, where Douglas completed secondary education at Glasgow Academy. 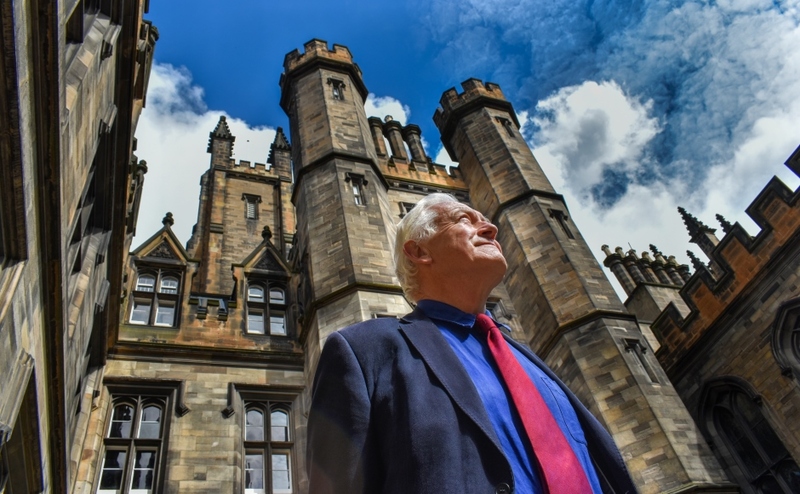 He left school in 1950, and began training as a Marine Engineer with Barclay Curle, serving part of his apprenticeship with them, while at the same time studying at the Glasgow College of Science and Technology. Eventually he could no longer resist the call to the ministry, and began studying for this goal in 1953. Poor health interrupted his studies in 1955, and national service was spent as a second lieutenant in the Royal Artillery, including time on Malta during the Suez Crisis in 1956. Douglas graduated MA from Glasgow in 1959, and then worked as student assistant at Glasgow Kings Park Church. It was during this time that he married Fiona Ritchie, whom he had first met at a Tell Scotland mission, where both were members of a mission team in a church hall in Springburn; this year would have seen their 58th wedding anniversary. In the best traditions of The Church of Scotland ministry, Douglas’ commitment and engagement did not stop at the Kirk doors, or, indeed, the doors of the BBC. He was chairman of the YMCA Hostels Management Commitment in Nairobi. In Scouting, as well as a stint as District Commissioner, he was National Chaplain for Scotland and a member of the UK National Chaplaincy Team, being honoured with Scouting’s Silver Acorn award. He was a Paul Harris Fellow in Rotary, chairman of Clackmannanshire Victim Support Scheme, and a Board member in the local Crossroads Care project, He served as a Liberal Councillor from 1980 - 1988 on Dunfermline District Council. His passion for people is well remembered by staff in the World Mission Council of The Church of Scotland, and The Church of Scotland Offices, as is his pawky sense of humour. These last four months, the cancer which Douglas had lived with for some years had spread, and he really appreciated the expert care he received while a patient in the Hospice Ward at Queen Margaret Hospital in Dunfermline. He is survived by his wife Fiona, and their three sons, Ewan, CEO of Cyrenians in Edinburgh, Stewart, Artistic Director of Aberdeen International Youth Festival, and Ronnie who works with the Royal Bank of Scotland and lives in Dunfermline. Also his 7 grandchildren, all of whom he was very proud of.